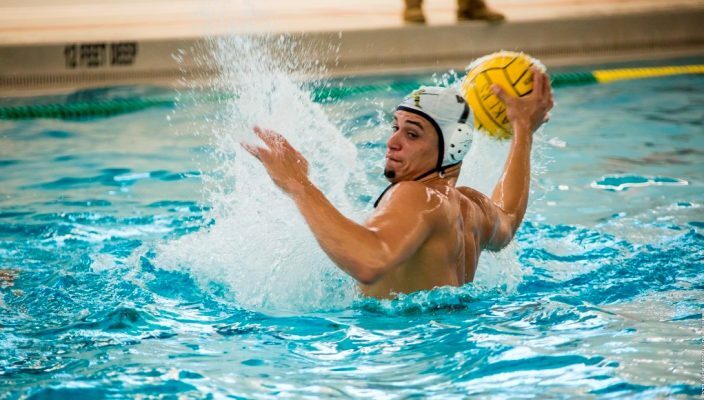 The Gannon University men’s water polo team finished its record-setting season by finishing seventh at the Mid-Atlantic Water Polo Conference (MAWPC) Championships in Annapolis, Md., on Nov. 19. The Knights, who set a school record for victories in a season, notched their 18th win in the battle for seventh place against rival Mercyhurst. The teams went to three overtimes before Gannon prevailed, 13-12. It marked the fourth time that the Knights had beaten the rival Lakers this season — the first time ever that Gannon had defeated Mercyhurst four times in a single year. The Knights led the Lakers 6-3 at halftime, but Mercyhurst used an 8-5 edge in the second half to force overtime. Neither team scored in the opening overtime period, but Mercyhurst took a 12-11 lead with 53 seconds remaining in the second overtime. However, Zarko Sadikovic came through with the game-tying goal with 17 seconds remaining, forcing a third overtime. Sadikovic then ended the game when he scored with 2 minutes, 9 seconds remaining in the sudden-death period. Sadikovic and Jack Donnelly each scored three goals for Gannon while Nick Williams, Gilberto Millan and Ethan Hamp added two apiece. Tony Squeglia also contributed one goal for the winners. The win enabled Gannon to finish 18-8 overall on the season and 1-2 in the tournament, as the Knights fell 10-7 to George Washington University in the first game and 12-11 to Johns Hopkins in the second game. The first-game defeat snapped Gannon’s winning streak at 16 — the longest in school history. The end of the season gives athletes and coaches alike time to reflect on the three-month schedule. The Knights started slowly, dropping three of their first four matches, but they were able to develop and upgrade their skills to land in the MAWPC Championship tournament. Gannon’s first opponent — George Washington — wound up winning the tournament championship after ending Gannon’s lengthy winning streak. Millan and Thomas Squeglia each scored twice for Gannon while Donnelly, Tony Squeglia and Hamp each added one. Millan also paced the Knights’ attack in the loss to Johns Hopkins, as their fourth-period rally fell just a goal short. Gannon trailed 10-6 going into the final quarter. Millan totaled four goals while Sadikovic and Williams each added two. Rehrer, Donnelly and Hamp each added single goals. Rehrer was upbeat when asked about the Knights’ future. “The team is building into something with so much potential and the goals will definitely be set high for us next year,” he said.